There are no photos with those IDs or post 22564 does not have any attached images! The next November 11 is celebrated in Moreda de Aller the traditional festival of San Martín or Party of the Humanitarians, declared of National Tourist Interest, a festival with more than one hundred years of age, which was born specifically in 1905. 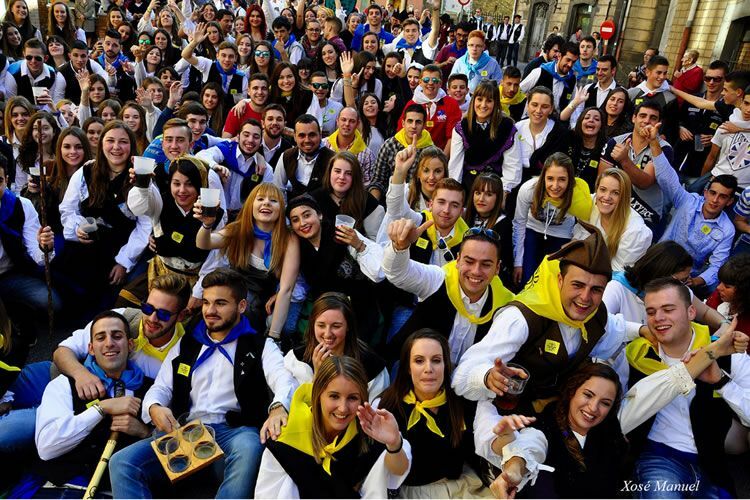 "This is one of the most typical festivals of autumn in Asturias". A party organized by the Humanitarian Society of San Martín, in which joy, fun and folklore take over the streets of Moreda. The 11 day of November the party starts from the 09: 00 hours in the morning with the fliers, the bagpipe and the drum that announce its beginning. The celebration is celebrated Traditional Saint Martin Mass, sung and accompanied by a bagpipe, in which the vast majority of people come dressed in the traditional Asturian costume. After the mass the Puya'l Ramu takes place, which consists of the auction of spelled bread placed in a wooden frame. Mid-morning starts the float parade, with dance groups and bagpipes bands, that cross the streets to the sound of the most traditional music. After the parade, the food of San Martín is given, a traditional menu consisting of the fabada, "les casadielles" and "el panchón". All catering establishments in the area offer this menu that complements the cultural offer of these parties. It is a good opportunity to know "Aller Adictos": a loyalty program linked to gastronomy and the tourism sector of the Aller council set up by the local council. The Aller Adictos card is totally free and with it you can get discounts and promotions in restaurants, accommodation, active tourism companies ... In addition, you will enjoy a 10% discount on scheduled gastronomic events.